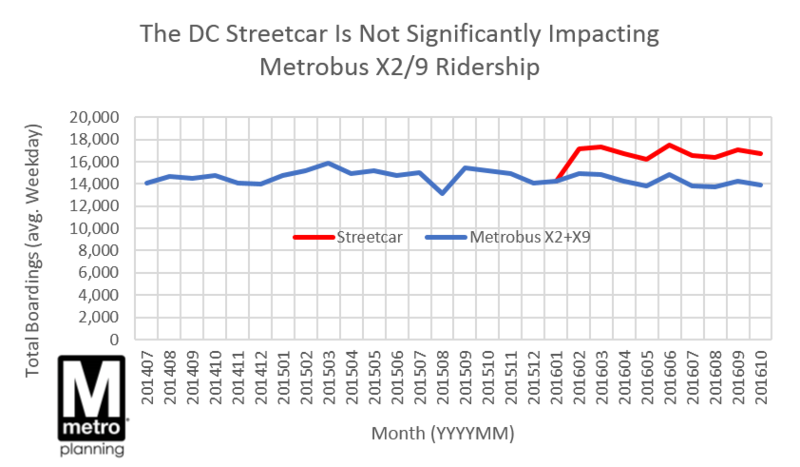 Is the DC Streetcar Hurting Ridership on Metrobus X2+X9? No. 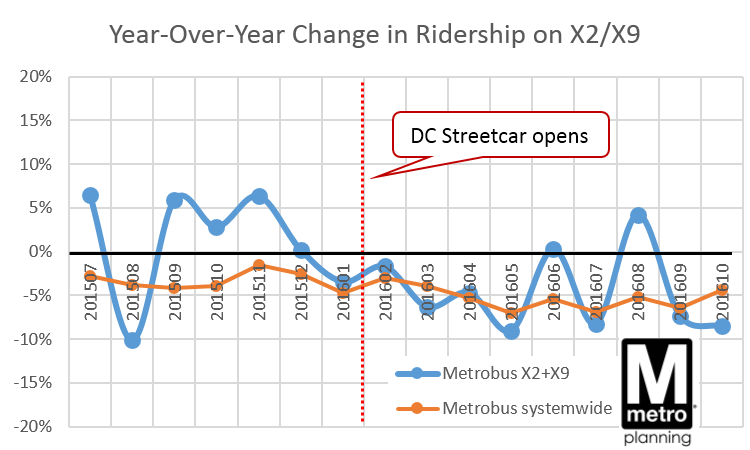 The DC Streetcar has not significantly changed ridership on Metrobus X2 and X9, even though the services overlap on H Street NE. Instead, the Streetcar appears to be serving a new, different market – and has increased net transit ridership in the corridor by 15%. Although the new first phase of the DC Streetcar serves some of the same sections of H Street NE as the existing Metrobus routes X2 and X9, the streetcar appears to be serving almost an entirely new market of transit riders. Ridership on the underlying Metrobus routes X2 and X9 have remained fairly steady, even as the Streetcar is serving over 2,500 new riders per weekday. Since it opened in February 2016, the DC Streetcar’s ridership has been climbing slowly and steadily, from around 2,400 to 2,800 boardings per weekday. 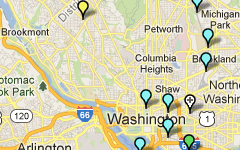 The route, just over 2 miles long, runs from near Union Station down the length of H Street NE. The X2 and X9 buses run on the same stretch of H Street NE, but stop at different bus stops and connect farther west into downtown D.C., and farther east to Minnesota Avenue. The overlap in markets is fairly small, and the ridership data confirm that the two modes are serving distinct markets – ridership on the X2 and X9 has remained flat, or only slightly down. Overall transit boardings between the two modes combined have risen 15%, from around 14,700/day before the Streetcar to 16,800/day now. (Note the lift in X2+X9 ridership in June, likely due to SafeTrack Surge 2). The Streetcar’s arrival does coincide with perhaps a minor shift in the rate of change in ridership on the X2+X9: monthly year-over-year change in ridership turned slightly negative last winter. But this is not dramatically different from the systemwide change in Metrobus ridership. So it’s not yet clear if this trend is due to riders switching to the Streetcar, or other forces. Although the two modes overlap for a short stretch of H Street NE, the arrival of the DC Streetcar appears to be serving a new, distinct transit market. The Streetcar has not significantly poached riders from the existing X2 and X9 Metrobus routes, which have much higher overall ridership and serve a larger geographic area. 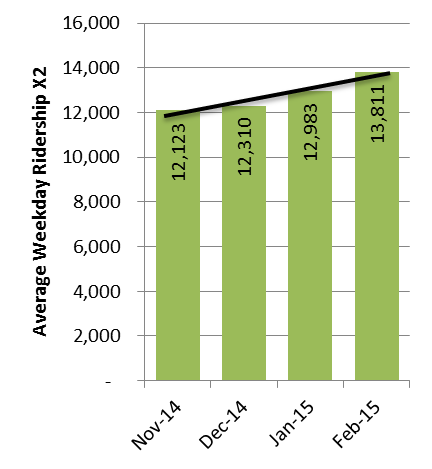 Ridership on the X2 Metrobus line has jumped 14% after Metro changed the way the line is managed. Through most of 2014, the X2’s on-time performance (OTP) averaged about 65% – well below Metro’s goal. Insufficient running time in the schedule, and disruptions from planned and unplanned detours along the route created uneven spacing between buses leading to “bus bunching” and long gaps between buses. These service gaps often led to significant overcrowding, particularly during the midday period. To meet demand, we increased the frequency of buses to an even 8 minutes all day long – 6:00am-7:00pm on weekdays. We deployed a team of dedicated supervisors on the street (at Minnesota Avenue and Lafayette Square) and at the Bus Operations Control Center to ensure even spacing between buses on weekdays. The X2 is now a “headway-managed” route on weekdays, meaning our primary goal is to maintain buses evenly every 8 minutes throughout the day. We adjusted the scheduled running times by about 15% for all trips. The results have been impressive: ridership has jumped 14% from 12,700/day in October 2014 to 13,800 in February, overcrowding (particularly during the midday) has been virtually eliminated, and on-time performance has grown to 83% – a remarkable achievement for a heavily congested urban corridor.